Featuring events organised by the centre, our partners and those that fall within our remit of promoting not only Tagore, but Indian arts and culture in general. Friends you do not want to miss this treat. We are very lucky to have the renowned Jayeeta Ghosh and students from her Geetanjali Academy of Fine Arts, performing songs in a variety of styles, including Rabindrasangeet and Hindustani Classical. The performance will start at 1.30pm, is free and is something you do not want to miss! 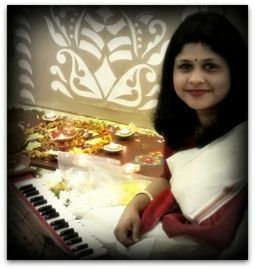 Jayeeta Ghosh, founder and director of Geetanjali Academy of Fine Arts, is an well-known Hindustani classical music teacher and a talented performer who aspires to spread the joy of music and fine arts to everyone beyond any boundaries. She currently has a strong base of students in the UK from various age and walks of life. 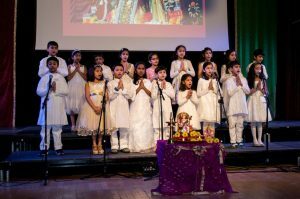 Jayeeta has conducted several recitals with her students and is also a member of the Youth Choir,England. As a performer she was recently invited for a solo performance at Nehru Centre in London, the High commission of India in the UK, at the Women in Music festival organised by Arts Council of England and SAMA Arts on 16th of May 2017. She was also felicitated at the House of Lords for her contribution towards music in the Harrow Area. Geetanjali Academy of Fine Arts aims to provide education of music, performing arts and fine arts to children and adults across all age groups and reach out to people with special needs in London (UK). It conducts in-person lessons as well as online, Skype and over the phone to suit everyone’s needs.